Inside... I made some progress toward the changes I want to make. On May 1, I stopped eating fast food. I've "cheated" twice - once picking up a turkey sandwich on the way back to work after a doctor appointment and once ordering Chinese take-out (which isn't exactly fast food, I guess). On May 18, I stopped drinking soda. I've cheated only once, indulging in a soda with pizza. This is fairly remarkable considering there's a beverage cooler full of free soda only 26 steps from my desk at work. A 6' tall glass-front cooler, I might add, so the tempting beverages are in full view. The constant fatigue is one reason I had blood tests done last week. All the results were normal except ferritin, which is related to the amount of iron stored in one's body. The normal range is 11-307; my result was 11. Even though that is technically normal, it's obviously very low. Research on the internet (which I do view rather skeptically lest I "die of a misprint") seems to indicate levels below 50 can cause symptoms such as the fatigue and hair loss I'm suffering. The hair loss is particularly disturbing. 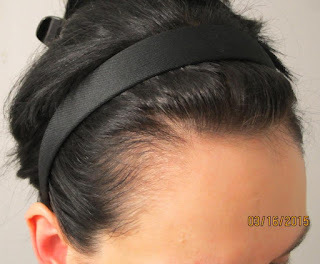 My hair has always been very thick, but around March, I noticed that two spots in the front were suddenly very thin. It is NOT normal to see scalp through my hair. I fervently hope that low ferritin is the only cause of the hair loss and that the hair will come back if I get my iron levels up (though it will probably take a year). My thick hair is one of the few things I like about my appearance and I will be crushed if I lose that. So what's coming up in June? I'll keep working toward my health goals. And I want to DO something... anything besides sit around and feel tired. Maybe I'll make a list of not-too-demanding projects and try to do one each day. I will feel better if I can accomplish things, even small things. Hopefully the dr will be able to deal wtih it and you will gt more energy. The b12 in my body eventually gets low without injections and I get very tired and get cold fingers and toes. for me it is just a case of monitoring it and getting it topped up if needs be. It's great that you can get a relatively easy treatment. Fatigue has such a negative impact on one's life... and having cold toes is just plain annoying. Thank you. Iron pills are readily available here, and I am now taking one daily. My digestive system isn't too happy about it - I was sick Friday and again today - but I hope that will pass. 11 is crazy (scary!) low indeed. My doctor instructed me to take an iron supplement as well. Thank you, I hope so. Low fatigue is a pain as it makes you feel constantly tired and sleepy. Hopefully by improving your ferritin levels will improve the condition of your hair. Anyway, hopefully, you'll have the issue remedied. It's awful... some weekends, I spend so much time lying down napping that my back hurts. :P Thanks. I hope so, too. and when you don't expect it bane comes back *lol* hope the hair problem will get better again soon! and congrats, the health goals seem to be quite an achievement even when cheating a bit! Thank you! I was thinking I'd put some purple in my hair as a reward for achieving some goals, but now I'm afraid to do anything new to it. Congrats on sticking to your goals of cutting out fast food and soda!! I don't consider REAL Chinese food as "fast food", either, unless you are going to the Chinese equivalent of Taco Bell or Panda Express. Just because it's takeout doesn't make it fast food! I think iron supplements will be a huge help to me... if my body will begin to tolerate them better. Twain made a very good point. I've read some pretty good information from reasonably legit sources online, but I've also read some totally preposterous stuff. Did you read the articles floating around the internet about the iron fish to put into non-cast-iron cooking pots to battle anemia? Maybe you just need a little fishy fish to swim in your soup. You will feel better after a few more no-soda weeks. If the temptation gets too real, try canned seltzer water. Bubbles and crack-pop-shhhhhh, none of the guilt. I'm sure I will feel better. I already feel more hydrated, which can only be a good thing.